XL Techgroups's (of Melbourne, FL) company PetroAlgae has been showing their Fellsmere located algae photo-bio-reactor (PBR) system to the media this month. Orlando TV station WFTV does a good job of covering the facility. At production rates of 10,000 - 40,000 gallons per acre the company hopes to "roll out the technology worldwide by 2009" according to the report. Some scientists are skeptical of the cost effectiveness of a closed PBR system, and are concentrating on cheaper-per-acre open ponds for algae growth instead. Either way, CO2-eating algae would be a wonderful alternative to exhuming dinosaur juice to fuel our vehicles. 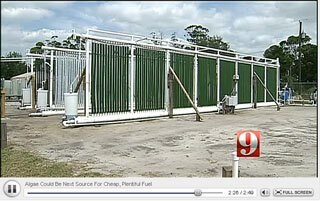 Orlando NBC station WESH has a report and video segment online detailing the work of a group of UCF students that are converting used Chick-fil-A grease into biodiesel via an Appleseed processor. The students also donate 20% of their processed fuel to the university for their use in dozens of on-campus diesel vehicles. The story notes the requirement to pay Florida state fuel taxes on home-brewed biodiesel. Overall a pretty accurate report. They have been draining smelly fryer grease and feeding it to their bio-diesel reactor -- a fancy name for a water heater, some pipes, valves, hoses, and filters that turn grease and two household chemicals into fuel. The newly formed fuel powers their diesel engine cars. "To make a gallon of bio-diesel, it's about 80 cents," UCF student Michael Schulist said. Not only cheap, the muddy looking bio-diesel burns cleaner than its petroleum-based cousin. "Petro-diesel is a very dirty fuel. This is a very clean burning fuel," Schulist said. It produces less CO2 -- the main threat to our climate -- than gasoline or regular diesel. "It would limit the amount of pollution we put into the air but it would also save a lot of money," UCF assistant professor Ali Gordon said.